Successfully Added 802.11N Router - Hi-Speed Internet Broadband Router (WLAN/LAN) to your Shopping Cart. 802.11N router for high speed connection at the next generation of internet speed for wired (LAN) and wireless (WLAN) internet surfing. This 802.11N internet network router utilizing the new 802.11N wireless standard with MIMO for a transfer rates 150-300Mbps. With 4 wired LAN ports and three antennas for efficient hi-speed Wifi signal transmission, the CVEL-K19 model 802.11N router will provide you the connection speed necessary for media streaming and productivity improvement while working via the internet. Bring the astonishing speed and amazing range to your computer that is available with the new 802.11N wireless (wifi) standard. Be able to connect to the internet anywhere in your home or office in ranges and speeds you have never seen before with this new 802.11N broadband router. Brought to you at the usual Chinavasion wholesale price, so get your stock now as the demand for 802.11N products is going to be red hot this year. WiFi 802.11N Wireless and Wired Local Area Connection (LAN/WLAN Router). Wirelessly connect to the internet via speeds of 150-300Mbps. Support for IEEE 802.11N / IEEE 802.11G / IEEE 802.11B standards. 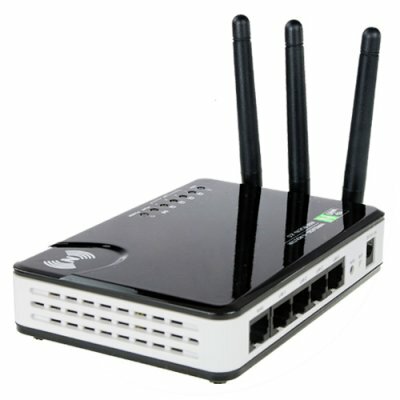 Dimensions (antennas up): 140mm x 90mm x 100mm (L x W x D) - 5.5" x 3.5" x 4.0"
Can this 802.11N router be used as a standard LAN router? Yes, you can use this as a standard wired router. It has 4 LAN ports for standard network cables. How do I log into the router? Instructions are included which provides the routers default IP address and steps for logging in. Once logged in you can access the units advanced setup and security features.